Chief Rabbi Goldschmidt, President of the Conference of European Rabbis, issued a scathing statement slamming Tuesday's first ruling by the European Union's top court on the issue of women wearing Islamic headscarves at work. According to the precedent-setting decision, employers may bar staff from wearing visible religious symbols. “This decision sends signals to all religious groups in Europe. With the rise of racially motivated incidents and today’s decision, Europe is sending a clear message; its faith communities are no longer welcome,” the statement read. Although Rabbi Goldschmidt comes off as a defender of Islam, he is right about one thing. If Muslims lose any of their religious rights, Jews will be next. Already in France, Jews wear baseball caps and other nondescript head coverings, not to mention the traditional, French beret, in order to maintain the Jewish custom of covering ones head. Religious Jewish women have done the same, but French style hats a couple of sizes too large, so that they can be pulled down lower than the usual style in order fully to cover their hair. Jews have been doing this throughout history, in order not to stand out, and risk ostracization, beatings, and even death at the hands of the residents of their non-Jewish host countries. American Jews have already been down this road. Even as recently as the 1990's a Jewish postal worker in "liberal," Southern California fought, and lost, for the right to wear a kippah (traditional Jewish men's head covering) to work. Meanwhile, in U. S. prisons the fight continues to obtain kosher food for Jewish prisoners, while Muslim prisoners already enjoy their hallal certified meals without any worries. Unfortunately, most American Jews will not make the connection that Rabbi Goldschmidt has. I will go further and suggest that not only will anti-Semitism rise, the Jews will also be blamed for the loss of religious rights of Muslims. Even though Jews are their biggest cheerleaders. This should come as no surprise to anyone, as getting stabbed in the back by those we have aided is embedded in the history of our people. Rabbi Goldschmidt himself still has not made the connection that the atmosphere toward "faith communities," is a signal for all Jews to leave Europe, and for Jewish leaders like himself to encourage the exodus, and subsequent journey back to the only home of the Jewish People, Eretz Yisra'el. 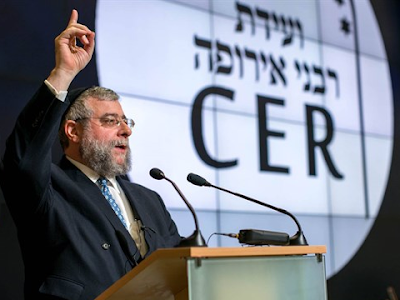 European Rabbis are right,...for once,...sort of. Rash"i suggests the possibility that only 20% of Israel left Egypt, at the time of our great exodus from there. How so? On the word hamushim, he offers an alternative translation to "armed." דבר אחר: חמושים אחד מחמשה יצאו, וארבעה חלקים מתו בשלשת ימי אפילה. Another thing: one fifth of five [fifths] left, and four parts (fifths) died in the [plague of the] three days of darkness. Several sources, such as the Kol HaTor, suggest parallels between our exodus from exile in Egypt and how we will complete our exodus from the current exile of Edom, including the possibility that only four fifths of us will make it out this time as well. Who knows? There might even be three days of darkness. However, this time final time around, will these days of darkness necessarily be physical? Instead, they could be spiritual, and unfortunately, the may have already begun for European Jewry. May our recalling of the exodus from Egyptian exile this Pesah (Passover) inspire those Jews still entrenched in Europe, to complete their own Exodus.